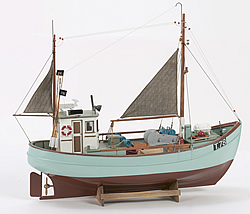 Billings Boats BIL603 Norden Cutter European Coaster 1/30 scale wood ship kit! The Norden is a typical coaster of the kind which was earlier very commonly used along the Western coast of Denmark. This type of boat was originally designed by local boat builders in the villages of Klitmoller and Vorupor around 1930. It represented an improvement of the existing boats and has remained unchanged, except that the ship now is a few feet longer and has a closed wheel house.